You can grant or revoke access using RFID tags or cards, or by entering a 6-8 digit code on the keypad. With the Z-Wave module (and a compatible Z-Wave controller), you can programatically add and remove codes so that you can enable codes at specific time or dates. For us, this meant we could create a code for the cleaner, but if they turned up at 2am on a Saturday, the door wouldn’t open for them. It’s connected to our Samsung SmartThings hub, and i run the RBoy Apps custom device type and smart app to enable the scheduled key rotation etc. Overall, we’ve been fairly happy with it, but the thing really does eat up batteries, and I started to feel guilty about putting between 4 or 8 AA batteries in the bin each month. Of course I also got annoyed at constantly having to buy them and change them, so I decided to try rechargeables. We bought some Panasonic Eneloop Pro batteries. I’d read a very interesting piece of research showing how high performance NiMH batteries actually outperform alkaline batteries – delivering a stable ~1.2v for far longer. As it turns out, this is a problem. With a regular battery, as the charge drops, the device detects this and fires off an alert reminding you to change them. As the research showed, however, NiMH batteries provide a fairly constant 1.2v until the “power” in the batteries is pretty much depleted, and then they just die. This isn’t a problem for a radio controlled car. 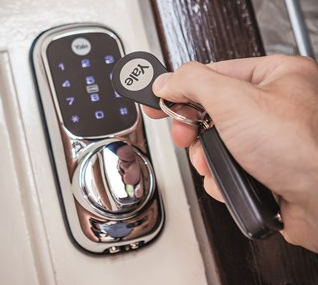 But of course if the batteries go flat on your front door lock, you can’t get in to your house as there’s no key override on it, and with no alerts, we wouldn’t know to change them. Although you can power the lock from the outside in an emergency using a 9v battery, after a particularly embarrassing situation where I discovered that the 9v battery I had stored in the glove box had expired 2 years ago, I decided to figure out how to wire the lock up to a permanent power supply. The main challenge here of course is that I would like to be able to unlock my house even when the power is out. After a bit of thinking, i decided that I probably needed a battery in there somewhere too. The first challenge is working out how to wire up the device. Ideally, didn’t want to be soldering connectors on. 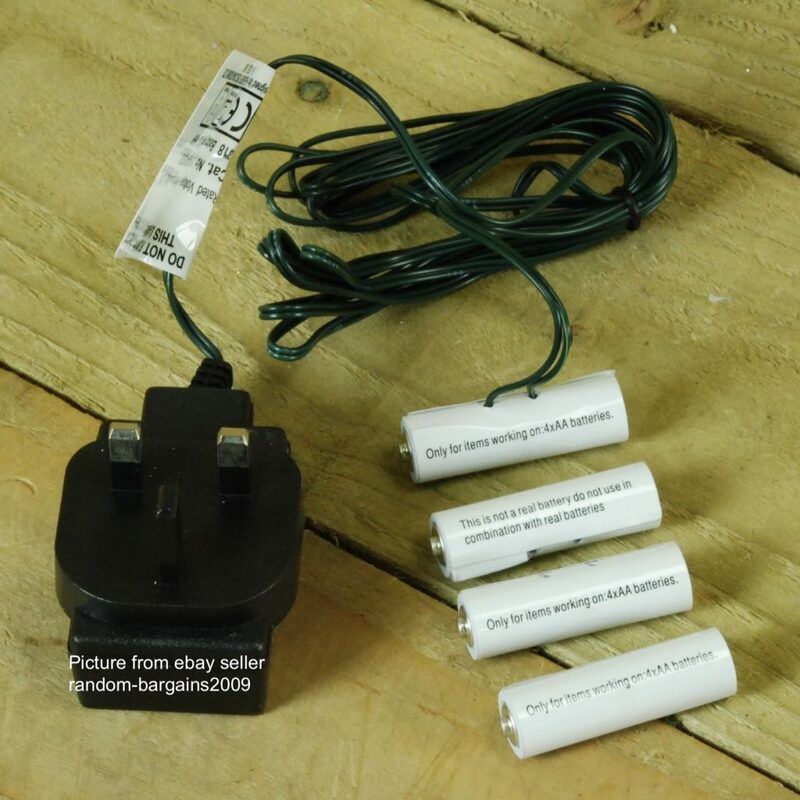 After a bit of research, I found a “4 X 6V AA MONEY SAVING BATTERY REPLACEMENT PLUG IN ADAPTER” on ebay (the item i bought is from “random-bargains2009” but there were three or four different ones from other sellers). This is basically an AA battery with a wire coming out of it connected to a mains adaptor, and 3 “dummy” battery blanks. I cut off the AC adaptor, and soldered on a USB A plug, and connected it to a Belkin USB battery pack, then plugged that in to a charger to keep it constantly topped up and … nothing. It turns out that Belkin battery packs can’t provide power and be charged at the same time. Doh! I tried another battery pack, and all was fine until my wife tried to come in about 5 minutes later. Apparently the “smart” charge controller built in to the battery didn’t detect sufficient current, and so switched off the battery pack. Brilliant. After a bit of research, I was able to find a 3,000mAh battery pack with a USB plug (from Amazon) that was designed to provide backup power for 12v CCTV cameras. Made by Chinese company TalentCell, it claims CE compliance for both the batteries and the charger. Mine arrived from Germany with an EU plug, but I already had some fused, screw fixed adaptor plugs, so not a problem. Finally, the I ran the cable around the frame of the glass in the door to try and keep it discrete, and I’m now confident that we won’t ever be locked out again. Hybrid peer-to-peer/5G vehicle communication technology, C-V2CX ("cellular-vehicle-to-everything"), has evolved since it's 2016 debut, with recent demos showing how it helps vehicles "see" threats and obstacles out of sensor range (such as cars coming around corners, traffic lights and so on). But it's not the only protocol on the block – Toyota, the world's largest car manufacturer, and GM, prefer a competing protocol based on wifi. The winner should start to emerge later this year when 5G trials begin. C-V2X enables vehicles to communicate, which should reduce accidents and aid autonomous driving. The conference has become the one that everyone working in the field of artificial intelligence wants to attend. Independent cybersleuthing is a realistic career path, if you can live cheaply. IBM is testing a paper test strip which, when analysed with an app on a standard smartphone, could reduce the time and cost for farmers trying to work out how to prepare soil for planting, treat water, or maintain optimal growth of crops. The card is about the size of a business card, and changes colour in specific patterns to measure pH, nitrogen dioxide, aluminium and other chemicals necessary for (or best avoided) for healthy plant growth. The app allows immediate, precise diagnosis (the camera is more a accurate colour sensor than the human eye), and aggregated data can help governments monitor fertilizer/chemical use. The IBM AgroPad is a paper testing strip that, when combined with a mobile app, relies on machine vision to measure the precise amounts of chemicals in samples of water and soil. Prof Jim Al-Khalili, incoming president of the British Science Association, will say in his presidential address that without both increased transparency and public engagement, AI could become uncontrolled and unregulated, in the hands of the powerful for the benefit of the few, or being seen as sinister and scary by a public which doesn't understand what it is or how it works. More public engagement, he says, is necessary to ensure that leaders and governments properly design regulations to ensure the technology is used in ways which does not increase inequality in society. The Verge has published a great round up on 5G, outlining the technical background, (US) carrier rollout plans, chip manufacturers, and phone vendor plans. It's only September, and already people are thinking about Christmas shopping, or so Amazon would have us believe. In what's pitched as an example of data science at scale, but which a cynic might refer to as a solid marketing campaign, Amazon's published their "Top 100 toys" to put under the Christmas tree, apparently based on recent sales and product searches. Online shopping for Holiday Toy List: Top 100 Toys from a great selection at Toys & Games Store. Sometimes the code i write doesn't work 6 months later – so I was incredibly impressed to read about the NASA team who reprogrammed the Voyager 1 space probe some 37 YEARS after the code was last changed. I can't imagine what the 40 hour wait between sending the commands and receiving the response was like. The Voyager team is able to use a set of four backup thrusters, dormant since 1980, for orienting the spacecraft.